I cast on this morning, and it’s moving quickly. I’ve decided to make it larger than the pattern calls for, because I’ve got lots of the yarn. We’ll see if I stick to that when I get to that point, though. 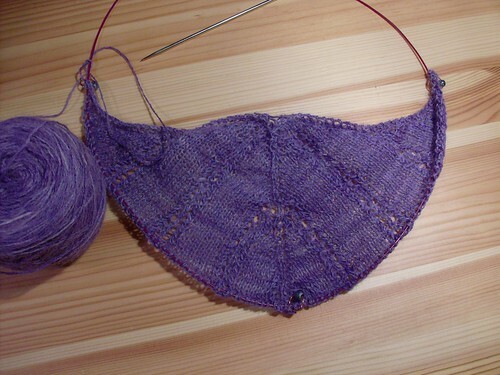 July 6th, 2009 | Tags: Knitting, WIPs | Category: Misc. Ha ha, you festival fool you!!! I love that color! I think I’m going to knit this next too – seems like a good travel knitting project. The only question is, do I want a pink or a green Icarus? That’s one that I want to knit, as well. It’ll be exciting to watch your progress. Oooooh…Icarus was absolutely one of my favorite shawls to knit…can’t wait to watch yours!! !